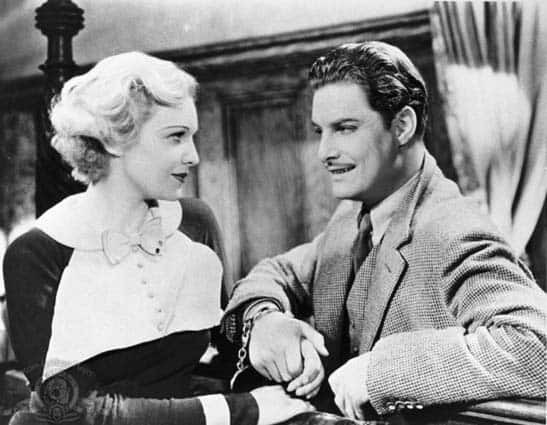 Madeleine Carroll and Robert Donat star in “The 39 Steps” being shown at Ludlow Town Hall. Saturday, March 5 at 7 p.m. — LUDLOW — “The 39 Steps” will be FOLA’s (Friends of Ludlow Auditorium) next movie in the Ludlow Town Hall Auditorium on Saturday, March 5 at 7 p.m.
“The 39 Steps” is a 1935 British thriller film directed by Alfred Hitchcock, starring Robert Donat and Madeleine Carroll. Based on the 1915 adventure novel “The Thirty-Nine Steps” by John Buchan, the film is about a man in London who tries to help a counter-espionage agent prevent an organization of spies called The 39 Steps from stealing top secret information. When the agent is killed and he stands accused of the murder, he goes on the run with an attractive woman to save himself and stop the spy ring. Several of the particularly Hitchcockian-features in the film include his us of the “icy, blonde female” as a leading character and his own participation in the film. The film was the first Hitchcock film based upon the idea of an “innocent man on the run,” such as Saboteur and North by Northwest. Scholars of his films regard this film as one of his best variations upon this particular theme. In 1999 it came in 4th in a BFI poll of British films and in 2004 Total Film named it the 21st greatest British film of all time. This will be the first of four major Hitchcock films shown by FOLA this month to demonstrate the character and growth of the great director’s talent. It will feature a brief introduction to Hitchcock by film expert Rick Winston who will discuss the evolution of Hitchcock’s craft, his favorite themes, his relationship with his collaborators, and his wry sense of humor no matter how grisly the subject matter. Mr. Winston is coming to Ludlow for this event courtesy of the Vermont Humanities Council. As with all FOLA movies, the event is free; donations are appreciated. Popcorn and water will be offered. For more info, call 802-228-7239 or visit FOLA’s web site, www.fola.us.